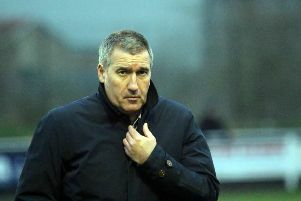 Banbury United boss Mike Ford is not a mathematician but he can quickly work out how many points his side has dropped from winning positions. The Puritans let the advantage slip yet again on Saturday at the Banbury Plant Hire Community Stadium, much to Ford’s annoyance. Ford said: “Without the dropped points from winning positions, we could be on 80 points plus with two games to go so those late goals have really cost us. If it was only happening now and then it would be different but it’s been happening on a regular basis all season. “We’ve not dropped points from losing positions but from winning ones. But we are where we are. “It’s been a tough season, so different to last season in many ways yet we still look like getting a top ten finish. We’ve still only lost 12 games all season and only the top five teams have conceded less goals. As for the reasons behind the late goals, especially in home games, which have contributed to as many draws – eight – as wins, Ford admits it’s something he has to address in the summer. But the lack of an experienced central defender is clearly a major factor, as were the changes within his squad before and during the season. He said: “We’re still a very young side and we lack an experienced defender, so that may be one of the reasons we have been conceding so many late goals. “But we need to read situations quicker than what we have been this season. The more senior players in the squad need to add organisation to their game. “This season has been very difficult, in terms of systems and formations, and there have been a lot of changes on and off the field. We lost Marvin Martin, Zac McEachran, Callum White and Jack Westbrook so we had to bring in more young players.